Last week during a period of mild weather, I wandered the garden and took stock of what's still alive after several snows and hard freezes. The carrots I'd bermed up with extra soil were still perfect, and I found a few turnips and parsnips that had escaped damage from deer. The parsley growing in a glass-topped cold frame looks great, and the winter onions under a row cover tunnel could not be happier. In addition to good cold tolerance, all of these winter vegetables (and several more) are biennials, which are plants that flower and set seed in their second year, after a period of winter chilling followed by the longer days of spring. In alphabetical order, true biennial vegetables include beets, Brussels sprouts, cabbage, carrots, cauliflower, celery, chard, collard, endive, kale, kohlrabi, leek, onion, parsley, parsnip, rutabaga, salsify, and turnips. True biennial vegetables will not bloom and produce seeds unless they are chilled and then exposed to warmer conditions with a longer period of light. This process is called vernalization, which translates as "to make like spring," and true biennials like cabbage will keep growing leaves but not flower buds if the plants are never chilled. 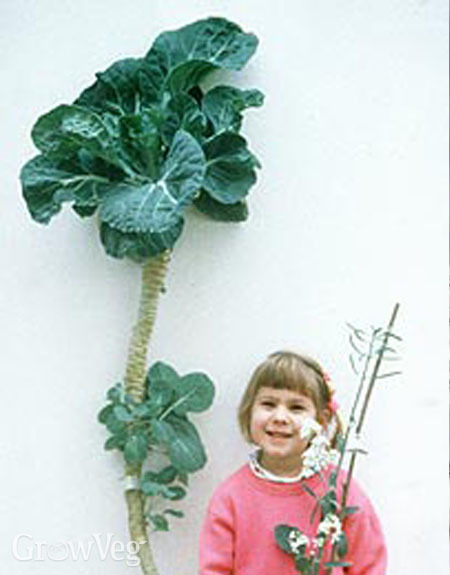 The photo above shows an unvernalized, greenhouse-grown five-year-old cabbage plant with the five-year-old daughter of Richard Amasino, professor of biochemistry at the University of Wisconsin-Madison. Amasino's lab studies plant signaling associated with the vernalization process. For a long time it was supposed that biennial plants had a way of tallying up exposure to cold, and when chilling reached a certain threshold they opened the gates to reproductive hormones. This is partially true, only it now appears that the vernalization process deactivates genes that suppress reproductive activities. When the suppressor genes get turned off, the plants get busy and bolt. How much cold does it take to make this happen? The answer varies with species. Celery plants will give themselves permission to bolt and set seed after exposure to temperatures between 40° and 50°F (5°-10°C) for 15 days or so, which can easily happen when plants are set out in early spring. Carrots want a much deeper chill, as in 6 to 8 weeks between 35° and 40°F (2°-5°C), so only overwintered plants bloom and set seed. With true biennials, all this holding back results in huge crops of seeds when vernalized plants are allowed to flower and ripen a seed crop. Out of curiosity, I have allowed overwintered specimens of many biennial vegetables to bloom and set seed, with very mixed results. Once beet seeds formed they took two months to ripen, and my seeds were puny compared to those I bought in a packet. Endive and leeks weren't worth the wait, either, but I've adopted three biennials as perpetual crops based on their talent for reseeding: celery, parsley and parsnips. 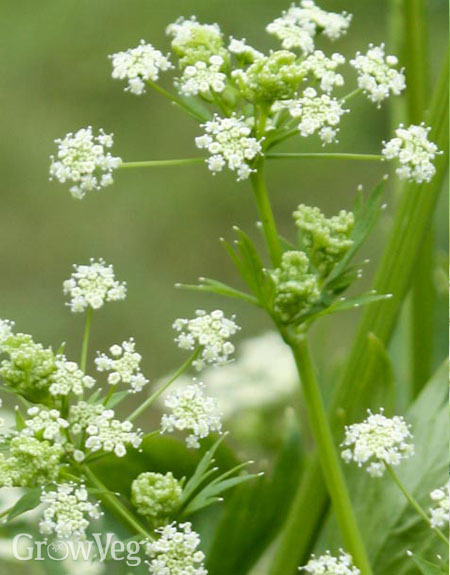 A celery plant in full bloom becomes a big cloud of tiny white flowers, and the plants waste no time ripening thousands of little seeds that can be gathered and used as a spice. Thousands more fall to the ground or are carried about by birds, and it has been my experience that the "seed rain" from two plants is heavy enough to give rise to numerous volunteer seedlings for the following two seasons. After that, it's time to nurse a pair of summer-sown celery plants through winter again, so they can provide another two-year supply of seedlings. Parsley can be handled the same way, though you must resist the temptation to gather parsley's pretty flower clusters for use in flower arrangements. Primitive flat-leafed strains of parsley are especially good at showering the garden with seeds, but you may have better luck identifying the little parsley seedlings if you work with a curly-leafed variety. Getting a good stand of parsnips is always a challenge, though Ben Vanheem's method for pre-germinating the seeds will greatly improve your chances of success. A second method that works is to allow a few plants to flower and set seeds, and to then sow the seeds as soon as they are ripe. In wildflower circles "sowing immediately upon collection" is a common practice with short-lived seeds, and I have found that when I scatter newly ripened parsnip seeds over prepared soil in midsummer, I have a thick stand of seedlings for my fall to winter crop. As for any turnips that manage to survive winter, I'll let them bloom for a while because they are so pleasing to bees, which is an honorable end for biennial vegetables that manage to make it through to spring. "Wow, what a fascinating post! I love how you dig up the most interesting things. I'm forwarding this link to my biochemist daughter. Please keep them coming!"